GLENDALE — Inspirited by nature, the vivid compositions of five Los Angeles-based artists will transform the gallery at Brand Library & Art Center, 1601 W. Mountain St. in Glendale, from May 13 to July 1. “Natural Selections” features the artwork of Amabelle Aguiluz, Sarajo Frieden, Wakana Kimura, Karin Lanzoni and Hiroko Yoshimoto in an exhibition that embraces the fluid and instinctive nature of each artist’s practice while honoring the sophistication of their invention. Opening reception will be held on Saturday, May 13, from 6 to 9 p.m.
Kimura’s artwork, monumental in size, appears to pay homage to the Abstract Expressionist movement of the West and the bold Zen Buddhist brush painting of her home country, Japan. The raw energy of the work, expressed in sweeping lines and splashes of color, is the initial seduction, but upon closer reflection the meticulous detail of the work emerges. Against the dynamic strokes of her calligraphic outbursts are fastidiously drawn patterns, symbols, animals, plants and deities from Buddhist iconography. The juxtaposition within the work arose from shifts in Kimura’s artistic and cultural perspectives over the last decade. Having focused her studies in Western abstraction, in particular on color, tone, and mark-making, she began looking for new inspiration in her work and was drawn back to Japan’s rich artistic heritage. The “markings” in her abstract work started to incorporate Japanese motif and what began with a single mark continued to build, facilitating a conversation, and now a visual communication between the East and the West. Kimura graduated from the Tokyo University of the Arts with BFA. After moving to the U.S. in 2007, she received her MFA from Otis College of Arts and Design in 2011. Her work has been exhibited throughout Japan and the U.S., with recent solo exhibitions at the Pomona College Museum of Art and LA Art Core. Kimura is the recipient of a fellowship to the Artist First Foundation. Yoshimoto’s latest series, “Biodiversity,” addresses the serious nature of the deteriorating biodiversity of species caused by human hands. 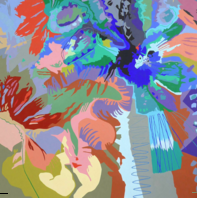 Her colorful abstract organic imagery conjure up the infinite variety and diversity of life forms like the microbes in a drop of water. The series reflects her ardent wish that life’s diversity would continue to flourish. Yoshimoto moved to Los Angeles from Japan as a teen. She has BA and MA in art from UCLA. 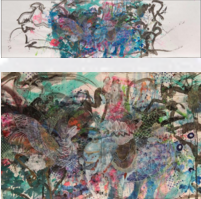 She has exhibited her work throughout the U.S. and internationally with solo shows at Carnegie Art Museum in Oxnard, Museum of Ventura County in Ventura, and Schneider Art Museum, Southern Oregon. She has curated numerous exhibitions, including shows at the Museum of Ventura County and Ventura College. She was a founder of Studio 83 artists’ co-op (1983-1999) and Ventura College Friends of the Arts. She served as a member of the Ventura Municipal Art Acquisition Committee and is a member of the Ventura Community Memorial Art Collection and the Museum of the Ventura County Fine Arts Committee. Gallery hours are Monday through Thursday, 10 a.m. to 8 p.m.; Friday through Sunday, 10 a.m. to 5 p.m. For more information, call (818) 548-2051, email [email protected] or visit www.brandlibrary.org.